Ever wanted to go on a safari and hang your find proudly mounted on your wall? No, I don’t mean the kind of safari where you wear khaki and shoot a poor animal in the Serengeti. I mean a thrift store safari. They have quite the selection of wild (stuffed) animals there. With a few crafty moves you could have a mounted head collection of your very own without harming a single hair on anyone’s head. 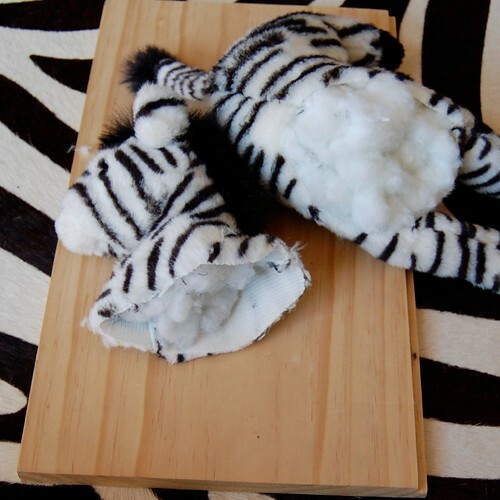 The first thing to do is decapitate your stuffed animal. It sounds morbid, but the end result is so cute you will feel better about the whole thing in a minute. I found my zebra at the thrift store, there is always a plethora of cast off creatures looking for a second chance at making someone happy. Once you have your head you will have a better idea about what size plaque you need. 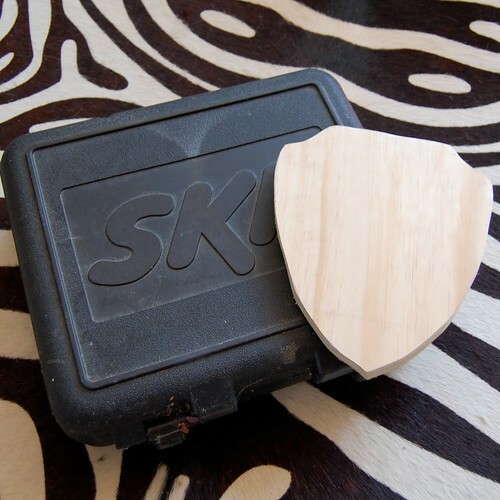 You can buy square or oval pieces of wood that work at most craft stores. 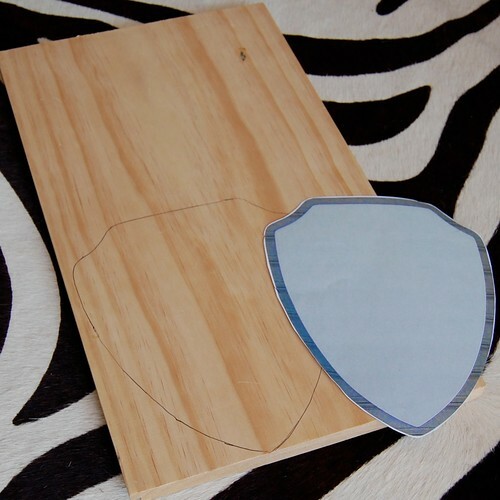 I of course was determined to have the traditional shield shaped plaque to give my zebra a more majestic feel. Well as majestic as a mounted stuffed animal could be anyway. I drew my design on the wood and using a saw I cut out the shape I needed. You may need to sand down any rough edges. Next up I used fabric paint on wood. Yup, I have done it before and know that it works. 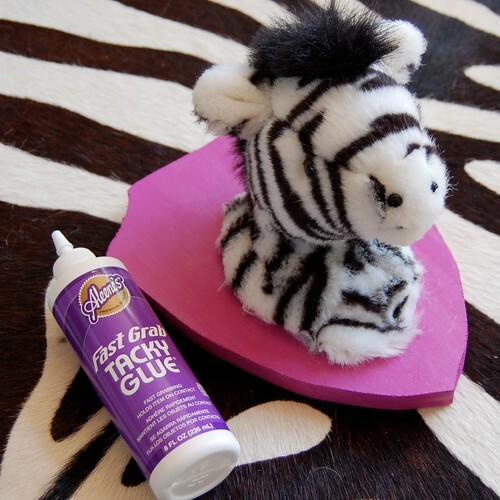 Interestingly I did it with a zebra themed craft project previously. 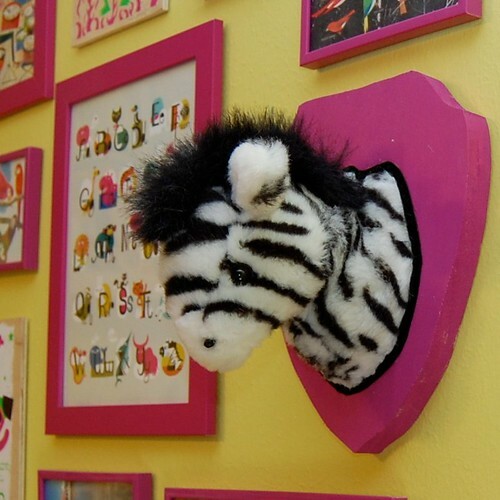 This mounted zebra is going in the same nursery, so it only makes sense. Once my paint dried completely it was time to mount Mr. Zebra. Using a combination of screws and Tacky Glue I attached the zebra to the plaque. You will just have to eyeball this part. 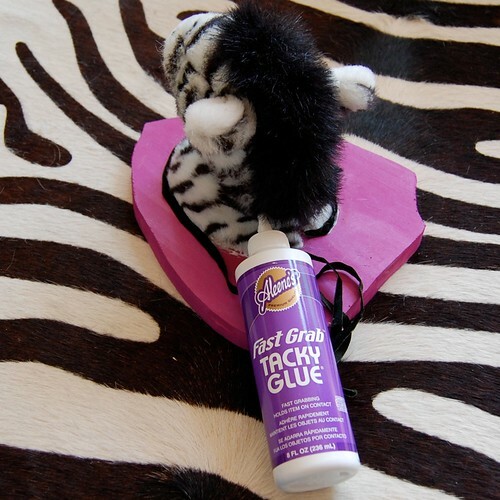 You want to pull the fabric on the back of the zebra’s neck taunt so that their head is up and not sticking straight out. It is best to nail or screw the fabric in place for this. Once your stuffed animal is positioned how you want them use Tacky Glue to attach all the stuffed animal edges to the wooden plaque. A little black trim was added around the rough edges to give the zebra a more finished look. So go ahead do a little poaching. Thrift store poaching of course. There are plenty of lions, tigers and bears just waiting to grace your walls. 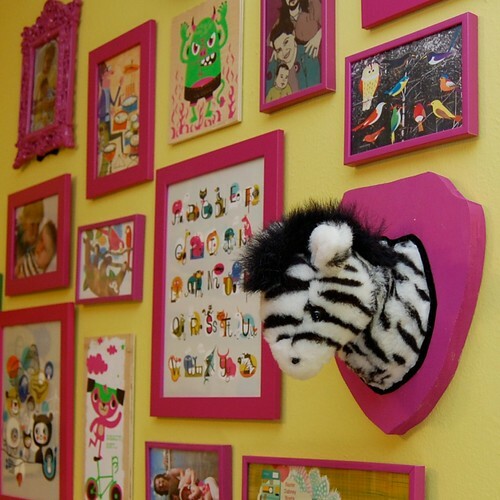 This would also be an adorable way to display your child’s favorite stuffed animals once they outgrow them. There is a Cabbage Patch Kid and a stuffed pink gorilla in my house who may soon have something in common with the Headless Horsemen. P.S. Thanks Mom for all your help!!! 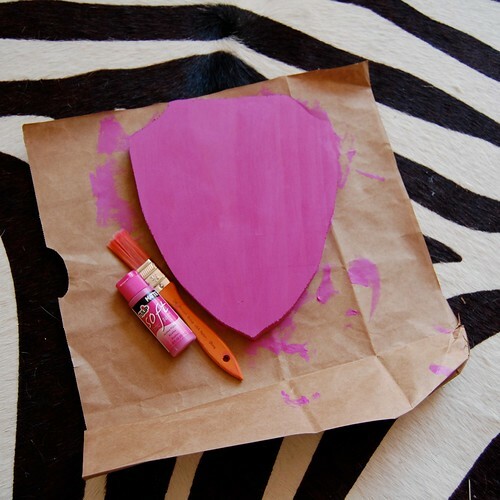 Posted August 18, 2011 & filed under Crafts, Home Décor Crafts, Home Decorating, Kids, Recycled Crafts. Genius!!!! I so want to do this now! I totally love this. What a great idea! Love this! 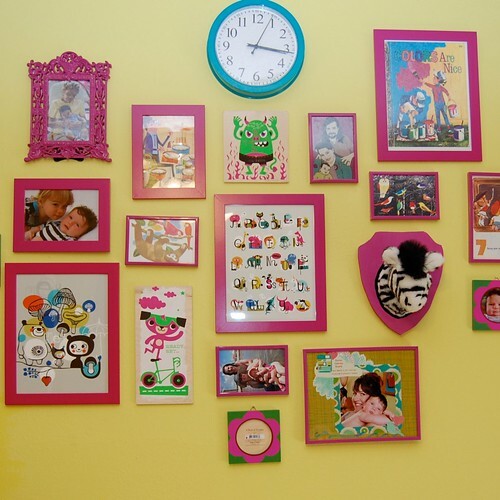 I also love the coordinated collage of all the pictures in the same colored frames – genius! ,,,,and I love the arrangement of art on the wall! Very Interesting blog i love your information you re really great informer. I have got to do this and hang it up at work. They do not know what they hired LOL! I like it! Love it! I think I need one over the fireplace. I would die if I saw this done with a Cabbage Patch Kid! Love this.